The Production Unit was a collective of artists engaged in a discussion on the intersection of politics and aesthetics who worked actively together between 2004 and 2008. 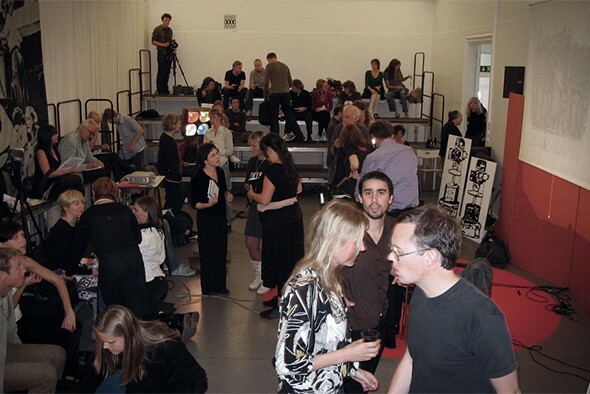 The collective arranged events such as Slowly learning to Survive the Desire to Simplify – a symposium on Critical Documents, 2006 (supported by NIFCA & IASPIS), Chto Delat/What’s to Be Done? – A Debate On The Avant-Garde as part of the Documenta 12 Magazine project 2007, exhibitions such as The Long Distance Runner – The Production Unit Archive at Den Frie Udstillingsbygning, Copenhagen, 2007 and the performative reading group Toward Evening Brecht Found me in the Garden Reading Capital during 5th Berlin Biennale. Petra Bauer, Kajsa Dahlberg, Runo Lagomarsino, Conny Karlsson Lundgren, Ditte Lyngkaer Pedersen, Nanna Debois-Buhl, Sara Jordenö, Johanna Gustafson, Ylva Westerlund and Tova Mozard.